This post is an update on the air-layering of a large club tree, Clerodendrum, that was done at the club meeting on Sept 23. 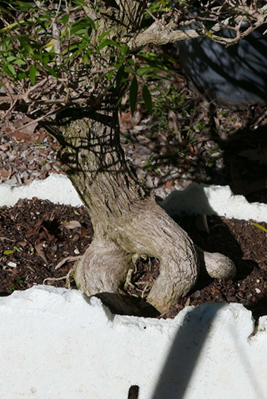 The first three pictures are of the trunk of the tree from a number of different directions. 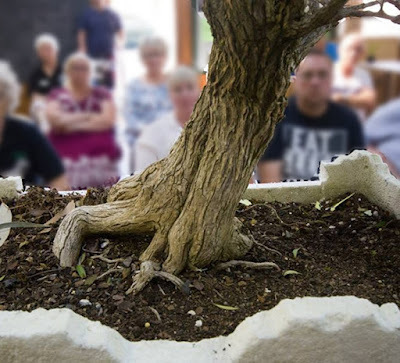 Suffice to say the nebari was pretty poor, comprising of very large primary root structures and no fine root development and trunk flaring. It was this poor appearance that was the motivation to complete an air layering or ground layering, to build a quality nebari to match the trunk. This is the start of the work. Once a line was drawn around the base, the cut could be made. Here it is nearing completion. 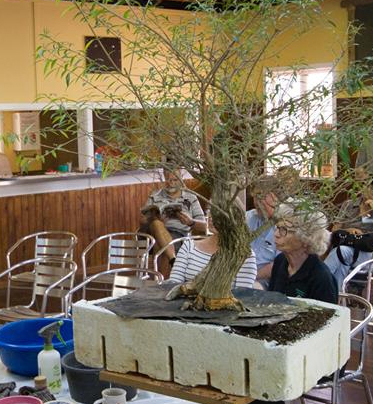 In this picture it is possible to gauge the size of the tree and the cut. 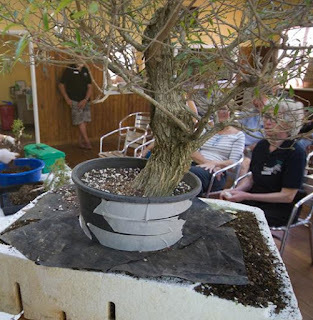 Having cut and removed the ring of bark, plastic sheeting was placed over the pot medium surface to make a tight fit against the trunk of the tree. 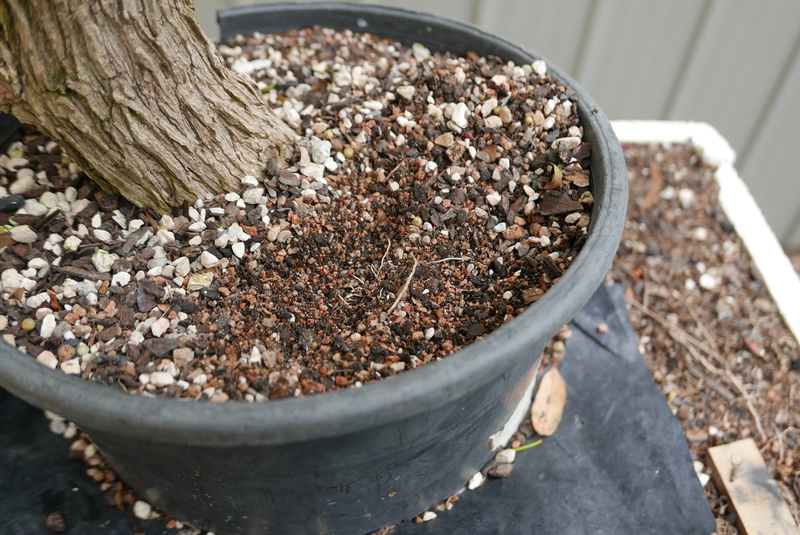 The purpose of this sheet is to minimize any upward root invasion of the planned layer potting mix. Without this barrier the tree's roots would rise up into the potting mix placed around the cut and confuse the signals about the layers success. Here the dam (just a cut off garden pot) is placed and filled with regular potting mix. 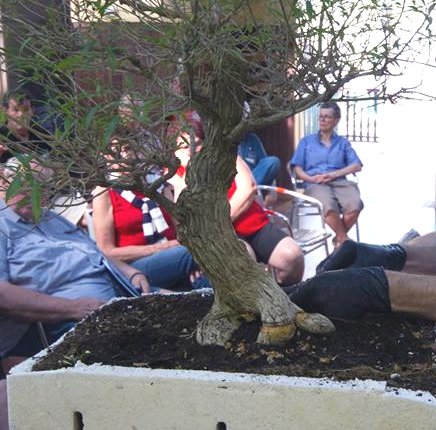 This is a picture of the tree 11 weeks later on December 9, just before stage two of the layering - the separation. 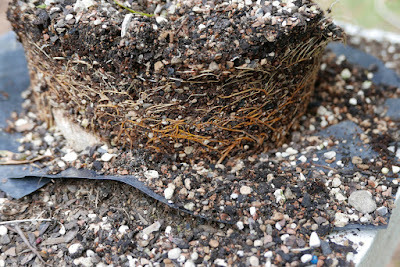 The first indication of success of the layering is roots just below the surface of the potting mix. 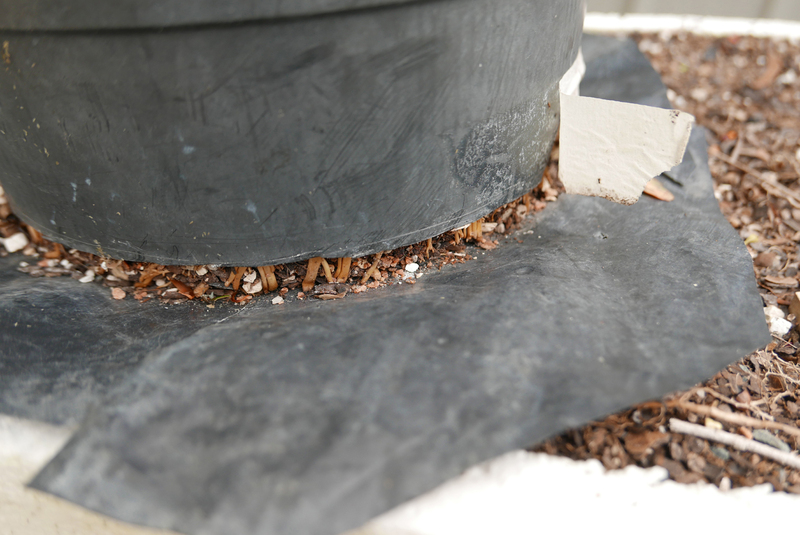 With the plastic sheeting in place it is unlikely that these roots have come up from the original root mass. 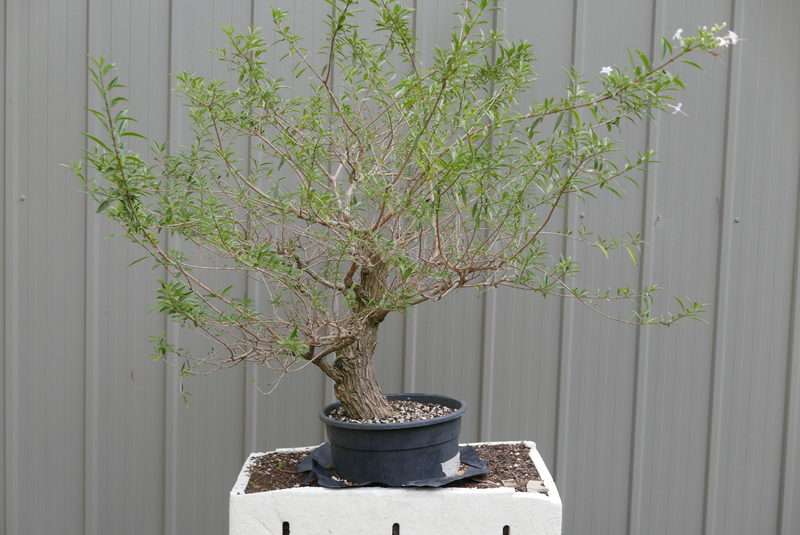 By just lifting slightly the dam wall the second favourable sign is more root evidence. 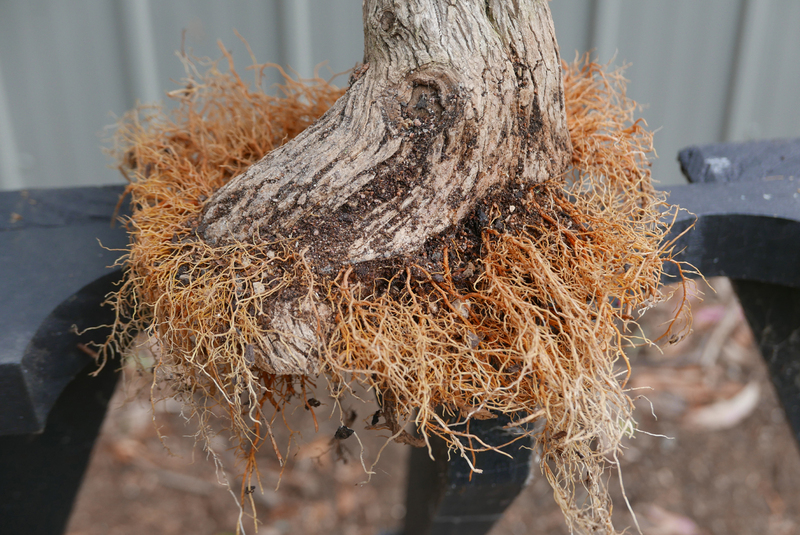 Taking the dam away entirely reveals very healthy and abundant root development. 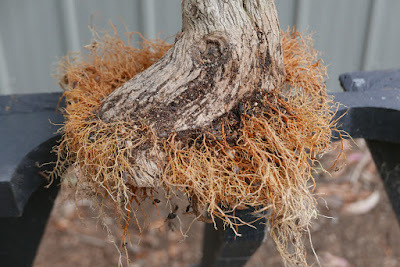 Here the surface is raked away from the trunk to reveal very good root development from all around the trunk. 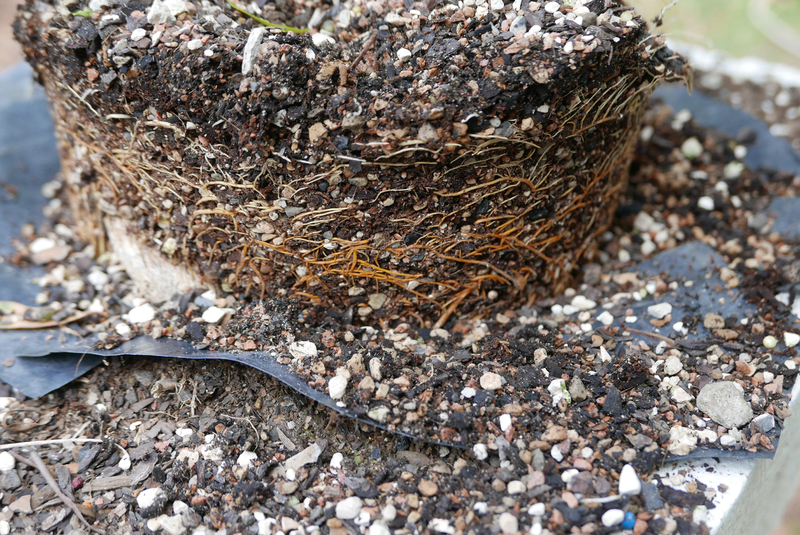 The pot was then tipped on its side to look between the plastic sheet and the layer cut to confirm the roots have come from the layer cut, making separation possible. 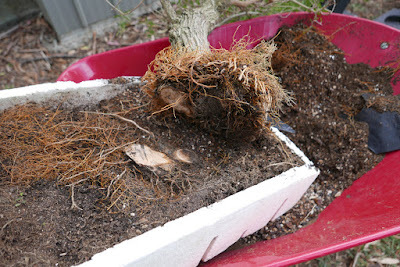 Here you can see the major components of the original root structure where they have been cut through. There was a handsaw in the previous picture but this cut needed a chainsaw. 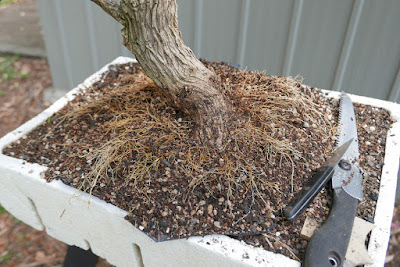 This picture shows the root development from the layering. To prepare for planting the roots were gently raked out radially from the trunk so that as they develop and gain weight they will be aligned to create an attractive nebari. 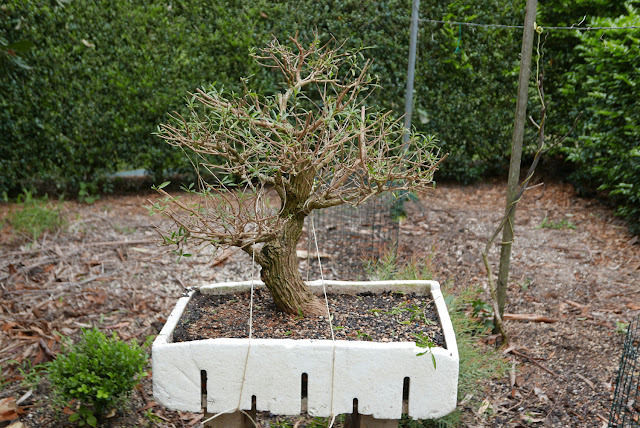 The final picture shows the tree returned to the poly box to grow on and stabilize. The branch structure was trimmed back to reduce any wind load and also to reduce any dehydration pressure from the much reduced root mass. 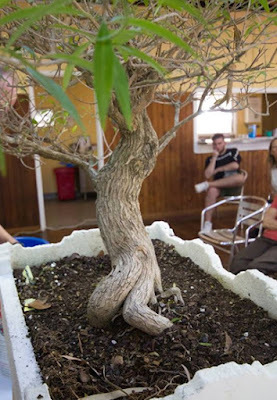 At this point the tree is just experiencing what any other tree would during a spring root prune and will no doubt respond in the same way, with abundant growth. 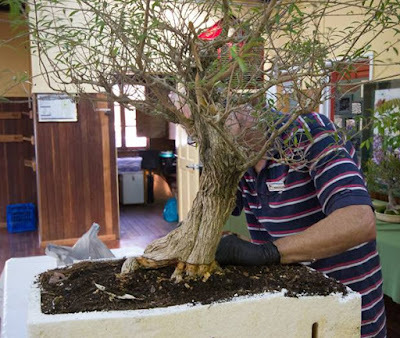 After a month or so for new roots to grow and stabilize the tree, the next stage in the rejuvenation can start - building a new branch structure - one that reflects the broadleaf character of the species and will leave the future bonsai looking like a tree!